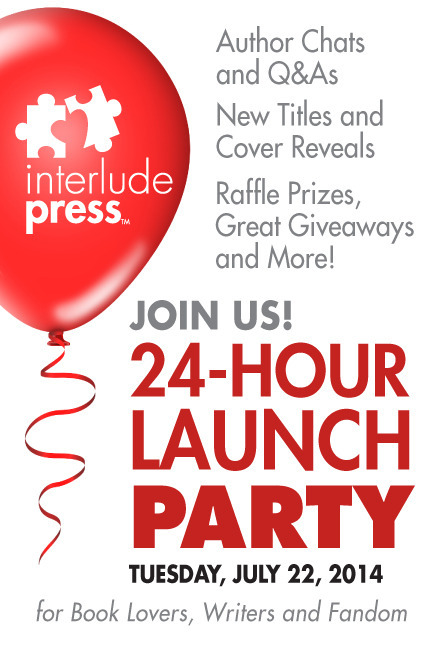 Snuggle into those pajamas, pour yourself a night cap and join us to celebrate the global launch of IP’s first books all day (and all night) July 22nd with our 24-Hour Launch Party! Starting at midnight Eastern time, we will host chats with IP authors on our Google+ channel every two hours. We’ll also reveal the Fall 2014 releases and cover art, as well as a sneak peek into 2015. And every session will include giveaways and raffles for IP and fandom swag, items for readers and writers and lots of IP books. GRAND PRIZE: One year of IP multi-format eBooks! No purchase necessary. Panel participation subject to change. Bleeding Heart/Platonic/Forever Man — Melissa Graves (missbeizy), Kate Paddington (doonarose) and AJ DeWall (iconicklaine). Fan fiction, fan culture and fans-gone-pro — Mila McWarren (wordplaying), Jan da Costa (januarium) and Laura Stone (stoney321) . From Fic to Novel: Featuring 2015 authors, including Charlotte Ashe (chazzam), Mila McWarren (wordplaying), Lissa Reed (glitterdammerung) and Zane Riley (zavocado). Writing Original Novels: Featuring 2015 authors, including Jan da Costa (januarium), Kate Fierro (anxioussquirrel), Courtney Lux (andercas), Jude Sierra (judearaya) and Mina Sloan (spinmybowtie), plus 2014 author Lynn Charles (dontbefanci). Want to win some prizes? Got a question you’d like answered on the broadcast? Submit a question that gets answered on air and you’ll qualify for prizes and IP swag. Submit them LIVE on Google Hangouts On Air, or send them in advance to promotions@interludepress.com. We’ll also be monitoring the #IP24 Twitter tag for questions. I’ll be giving away a copy of my book…stay tuned for details!